A termite inspector will look for warning signs of termites and here are some of them. 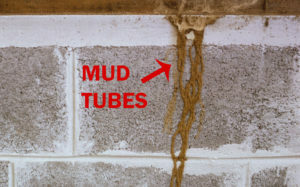 Mud tubes are the ways that subterranean termites connect their colonies in the soil underground to their above-ground food sources. These are made out of soil and wood combined with termite saliva. Subterranean termites can’t survive without moisture and are vulnerable to dehydration. Therefore, these tubes offer shelter that locks in moisture, and protects the termites from dry air and predators. What do mud tubes look like? There tubes are 1/4 to 1 inch in diameter. They are easily noticeable when present along exterior concrete walls or a home’s foundation. However, subterranean termite tubes can also be hidden in normally inaccessible places, like inside walls, crawlspaces, cracks in the foundation or behind baseboards. Drywood termites live inside wood and they do not have to go to the soil for moisture. In fact, they have minimal need for excess water. They do create small hard droppings that are ridged and the colour of the wood that they feed on. Drywood and dampwood termites live entirely inside the wood on which they feed. Therefore, you might not see signs of their presence, unless you see a swarm* or droppings underneath damaged wood. Also note dampwood termites rarely damage homes. 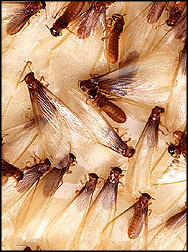 *Termite swarms may take place inside or outside of a home when mature termites leave the nest to start new colonies. Soon after swarmers take flight, they shed their wings. You may find small piles of wings in spider webs and on surfaces around your home’s foundation, like window sills. 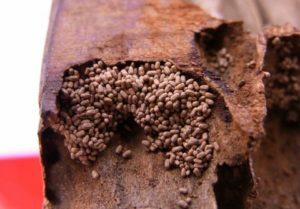 When drywood termites clean their nests, they push their droppings (remnants of digested wood) out through kick out holes also known as exit holes in the wood. You may find little mounds of pellet-shaped droppings directly underneath these holes. Subterranean termites generally do not leave behind visible droppings beacause they use them in construction of tunnels and mudtubes. Drywood termite droppings have six concave surfaces and rounded ends. When drywood termites swarm, they leave their nests through these holes in the wood. Identifying correctly these holes as exit holes from termites and not from wood-destroying insects, your pest professional can locate termite colonies and provide effective treatment. What do termite holes look like? Termite exit holes are round and are 1/8 of an inch or smaller. After the swarming termites (alates) have left the nest, these holes are sealed by nymph termites. 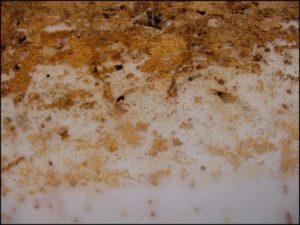 To plug termite holes nymphs use a brown, cement-like material made out of feces. If you do not locate the source of the colony during or soon after the swarm takes place, it is highly likely that you will not see these holes uncovered. 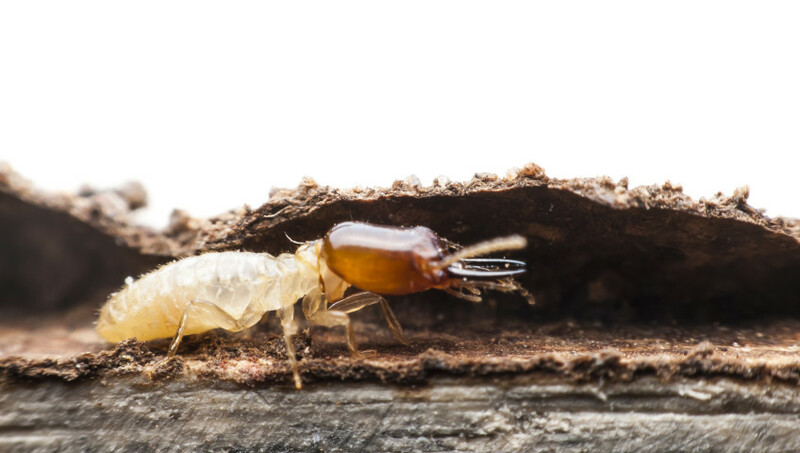 Swarming subterranean termites do not leave exit holes in wood because their nests are in underground in the soil and exit their nests via mud tubes that direct them to the surface. It is important to contact a termite professional to determine whether the holes are termite exit holes as there are other wood-destroying insects and pests such as beetles, bees and wasps can create exit holes in wood too. These professionals use the wood age and type, and shape and size of the exit holes, to correctly determine if termites are the culprit. When subterranean termites infest wood, they usually will not emerge into sunlight or air as light and dry air can be harmful to them. For protection, they live just below the surface of the wood in galleries (tunnels created by termites in the wood) which contains moisture, brought by the termites. If you have any painted surface which has moisture behind it in your house it can attract termites. 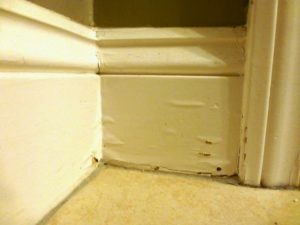 The painted surfaces adjacent to termite infestation may peel or bubble due to the moisture created by the termites or other reasons such as water leaks or poor ceilings. It is no guarantee that bubbling or peeling paint on a structure has a termite infestation, but it can be a sign of moisture. Another way that bubbling and peeling paint relates to infestation is that if the termites consume the wood directly behind the paint, there is nothing holding the thin coat of paint and it will crack, bubble, or peel. Therefore, professional help is needed to determine the cause. What do paint damages look like? Seymour Consultants provide timber pest inspections, treatments, general pest control and different forms of protection depending on your needs. We have been providing our expertise, skills and knowledge to the strata industry for over 15 years and have an intimate understanding of building and construction requirements. You can access our termite services here.